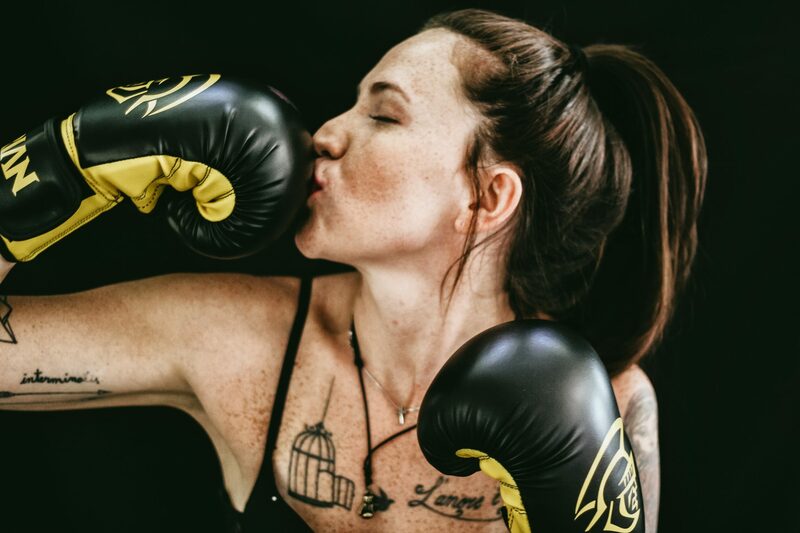 Today we’re going to take some boxing footwork and head movement drills and combine them into a fun cardio boxing routine you can do without the risk of being tapped in the face by anyone. It’s worth noting that these drills are for entertainment purposes only and will not be teaching you how to fight or evade. If you want to learn that, take an actual martial arts class and not a cardio class [if you’re in Portland, OR check out Northwest Fighting Arts]. If you want to burn a lot of calories quickly and activate a bunch of muscles, keep reading. This entire routine will take 11 minutes (shocking, right) and should be followed up with any of the abs / glutes weekly challenges. Set your clock for 3 minutes of work, 1 minute of rest for 3 rounds. You are going to be marching forward and back across a room so make sure there are no tripping hazards around to get in your way. Let’s start with how to stand. If you’re left handed please reverse everything I say. Put your feet together. Turn your right foot out 90 degrees (your right foot will now be touching your left heel) then 90 degrees in (both feet will be facing forward), 90 degrees again, and finally 45 degrees. Your feet will be a little larger than shoulder width apart with your right foot angled away from your body. This is the cuban style measurement for a boxing stance. I myself haven’t even come close to mastering this step yet, but stay loose in your legs. Bend your knees but don’t go too far down into a squat or lock your legs up. You want to be able to move. Keep your hands up by your face at all times. Yes this is cardio class so no one is going to slap you in the head, but keeping your hands up adds an isometric additional benefit to your workout in that holding your arms up can get tiring. Punching – Keep the elbows tight to the body. Rotate through the hips (especially on the straights) and snap your arm back as quickly as you can after you’ve thrown the punch. 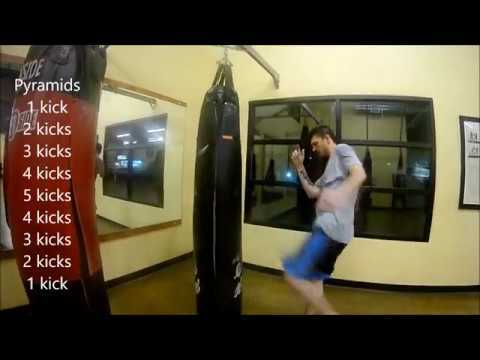 There are a variety of tips in the video below as it relates to making a fist, punching, kicking, as well as a variety of other topics. 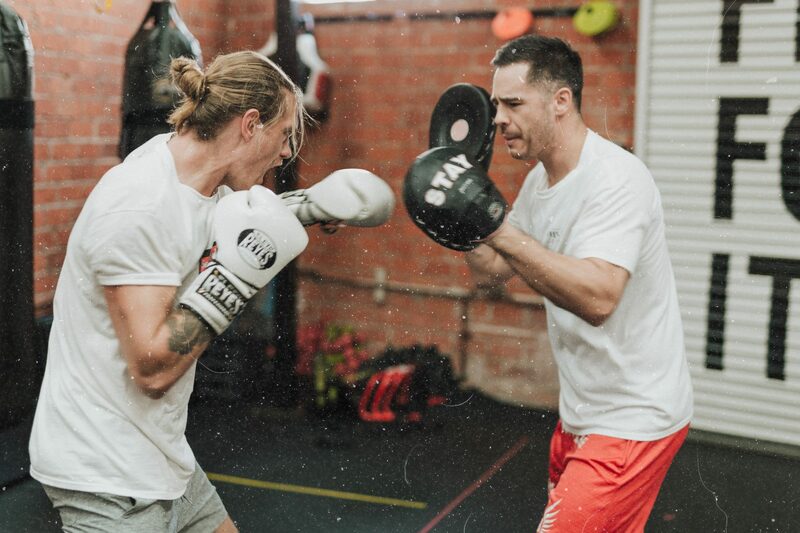 When you’re moving forward for this one you are going to throw a jab (if you’re right handed, a jab is with your left hand, if you’re left handed its with your right) then slip to your outside left. The slip consists of a slight step on your left foot accompanied by pulling your head down and to the left by crunching your oblique. Don’t drop your head down farther than you would actually need to in a self defense situation. This will help with keeping your neck happy as well as not expend unnecessary energy. Once you get across the room you’re going to throw a straight (or cross) then outside slip to your right. The outside slip to your right is a slight step with the right (back) foot and a pulldown of the oblique on the right side to pull your head down and to the right. This round is designed to work your obliques, shoulders, hips, etc. Moving forward everything will be to the left, moving back everything will be to the right. It doesn’t matter if you throw a hook or an uppercut for the purpose of this drill. A U Slip is used to avoid someone throwing a hook at you. If you are slipping to the left you want to pull your head slightly to the right, drop down into a squat, roll your head from right to left then snap everything back to center as you stand up. Take a small step with your left foot as soon as you snap your head to the right. Keep your eyes up at all times (don’t look at the floor.) Additional step – while your snapping everything back up throw an uppercut (or a hook.) Your body is loaded up and powerful as you’re springing back up so this type of maneuver will have additional power behind it. This routine could also be used as a warm up to get the body moving before moving into any of the spartan style workouts. 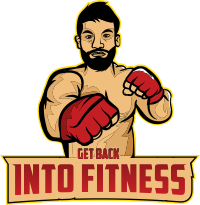 Should I try Muay Thai if I’m out of shape or overweight?